In the Netherlands, at the end of October and beginning of November, death has a double face. How can we explain the difference between death in Halloween celebrations and All Souls commemorations? On 31 October, death is part of the playful shuddering and shivering scene of Halloween. 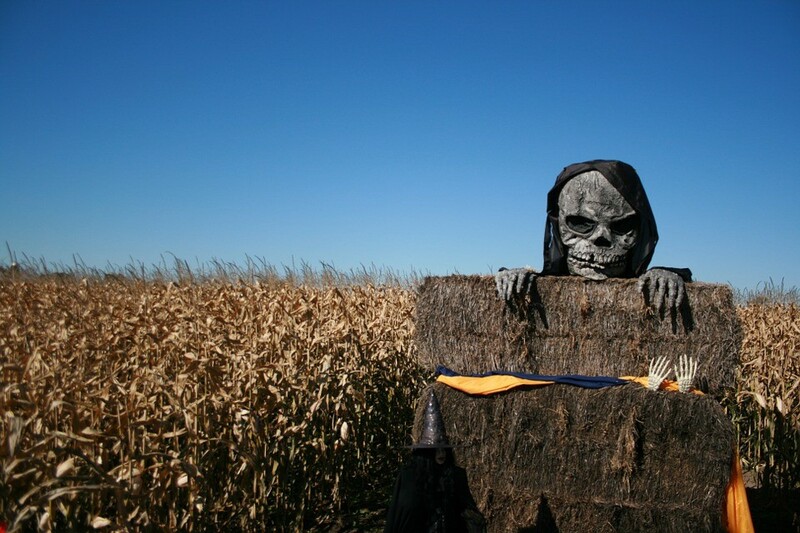 In the past years, Halloween celebrations have gained popularity in the Netherlands. Halloween – a contraction of Hallows evening – is celebrated the evening before All Hallows’ Day on 1 November, which is followed by All Souls’ Day on 2 November. However, in contemporary Halloween celebrations in the Netherlands, Halloween no longer seems to be connected to All Hallows’ Day and All Souls’ Day. Just as contemporary Carnival no longer seems to be connected to Lent and has become a celebrations of its own (only the ‘original’ date remains), Halloween has also become a secularized feast that is celebrated on the ‘original’ 31st of October. Because death in Halloween is decoupled from the death of family and friends, Halloween can deal playfully with the theme of death. Fancy dress shops and decoration shops offer Halloween costumes and attributes for children and adults. Part of these costumes and attributes are related to the theme of death. Skeleton costumes, skulls (with lightning eyes), decorative tomb stones and dancing skeletons are used as attributes to celebrate Halloween. Dressed up as a living skeleton, or wearing the mask of a skull, people meet to celebrate a party in which shuddering and shivering attributes and performances create a ‘Halloween atmosphere’. The visualisation of death through, for example, skeletons and skulls is happily used to scare people. During Halloween, people enjoy being embraced, shuddered and shivered by death. Just a few days after Halloween, death is no longer an actor of joyfully shuddering and shivering. At the beginning of November, death is surrounded by dignity and respect in all kinds of religious and non-religious commemorations, such as All Souls commemorations and Lichtjesavonden (evenings of the light). Wearing a skeleton costume during All Souls commemorations would be a transgressive act, as the real dead are not part of the playful morbid space. The two different faces of death in such a short period of time raise the question how to deal with this ambiguous face of death. How does it come that humans enjoy the theme of death in Halloween, while the commemoration of deceased beloved ones is surrounded by dignity, respect and a calm, warming atmosphere? Of course, there are differences in how death is part of both Halloween and All Souls commemorations: during Halloween ‘death’ is a broad theme that does not directly relate to the death of a specific person, while during All Souls commemorations people commemorate their deceased family and friends. Because death in Halloween is decoupled from the death of family and friends, Halloween can deal playfully with the theme of death. The skeletons and skulls of Halloween can, together with zombies and vampires, be categorised as ‘Undead’. People are fascinated by the morbid, macabre character of these dead. In this way, the undead create a morbid sensibility. “Morbid sensibility refers to people’s willingness to deliberate death in the context of popular culture[,…] the Undead are a key embodiment of this morbid sensibility” (Penfold-Mounce, 2018, p 66). Together with their cousins ‘the authentic dead’, which are the dead in television series such as NCIS and CSI, the undead create a morbid space that is not avoided by human beings, but embraced and enjoyed. The Undead and the authentic dead in popular culture are not to be confused with the real dead, the beloved deceased ones to which we have had a personal relationship. By distinguishing between various categories of dead, it becomes clear that the dead in contemporary Halloween celebrations in the Netherlands have nothing to do with the dead that are commemorated during All Souls commemorations. Wearing a skeleton costume during All Souls commemorations would be a transgressive act, as the real dead are not part of the playful morbid space. However, for the future of Halloween there is no reason to let the Grim Reaper rest in peace. Janieke Bruin-Mollenhorst is a PhD candidate in the Department of Culture Studies focussing on music during funeral rituals.